"We are joined together today in sadness, shock and grief." President Donald Trump today called the deadly shooting in Las Vegas on Sunday night an "act of pure evil." "We are joined together today in sadness, shock and grief," Trump said from the White House. At least 58 people were killed, and hundreds more were wounded when a gunman fired on concertgoers from the nearby Mandalay Bay Resort and Casino. 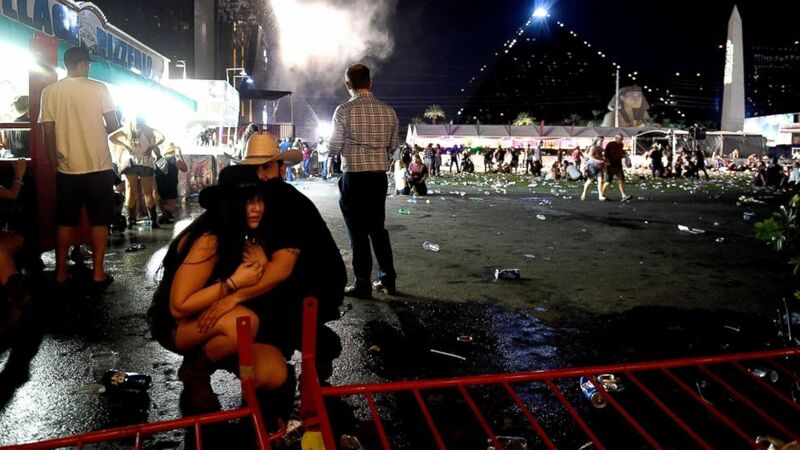 It is the worst mass shooting in modern U.S. history. Trump said he ordered the White House to lower its flags to half-staff in memory of the victims. He offered condolences to the families of the victims and said he would be praying for a "full and speedy recovery" for the injured. He thanked the first responders and the officers of the Las Vegas Metropolitan Police Department (LVMPD) for their "miraculous" speed in responding to the scene. "To have found the shooter so quickly after the first shots were fired is something for which we will always be thankful and grateful," said Trump, who later spoke on the phone with LVMPD Sheriff Joseph Lombardo. He said he will visit Las Vegas on Wednesday "to meet with law enforcement, first responders and the families of the victims." "Our unity cannot be shattered by evil. Our bonds cannot be broken by violence. And though we feel such great anger at the senseless murder of our fellow citizens, it is our love that defines us today -- and always will, forever," Trump said. After his remarks, Trump ignored questions from reporters on whether the shooting was an act of domestic terrorism. But during his meeting with Thailand's Prime Minister Prayut Chan-o-cha in the Oval Office, Trump said today was a "sad day" and a "very, very sad moment for me and for everybody." The president and first lady Melania Trump, as well as Vice President Mike Pence and his wife, Karen Pence, later led a moment of silence on the White House South Lawn. Earlier this morning, Trump sent his "condolences and sympathies" to the victims and their families of the shooting. (David Becker/Getty Images) People take cover at the Route 91 Harvest country music festival after gun fire was heard, Oct. 1, 2017 in Las Vegas, Nevada. House Speaker Paul Ryan ordered the flags that fly over the U.S. Capitol to be lowered to half-staff. “America woke up this morning to heartbreaking news. This evil tragedy horrifies us all," he said in a statement. "To the people of Las Vegas and to the families of the victims, we are with you during this time. The whole country stands united in our shock, in our condolences and in our prayers." The Pences said they were praying for the victims and families affected by the "senseless violence." First lady Melania Trump and first daughter and White House adviser Ivanka Trump also responded to the shooting. Las Vegas Mayor Carolyn G. Goodman thanked the first responders. Nevada Rep. Dina Titus said Las Vegas is a "resilient and benevolent town that will not be intimidated by acts of violence." Nevada Gov. Brian Sandoval called the shooting a "tragic and heinous act of violence." Nevada's two senators — Republican Dean Heller and Democrat Catherine Cortez Masto — said they are continuing to monitor the situation. House Majority Whip Steve Scalise, R-La., who returned to work but is still recovering after being shot during a congressional baseball practice in June, tweeted that he and his wife are praying for the victims. Scalise also encouraged others to donate blood as a way to help those injured in the shooting. "In this tragic moment, I encourage people across America to stand together in solidarity, and to support the Las Vegas community and all of those affected, especially by giving blood and encouraging others to do the same," Scalise said in a statement. "In the face of unspeakable evil, our whole nation must respond with countless acts of kindness, warmth and generosity." The two Democratic senators from Connecticut, where the Sandy Hook Elementary School shooting took place in 2012, called for action by Congress. "This must stop," Sen. Chris Murphy, who held an all-night talkathon in June 2016 urging action in Congress on gun control, said in a statement. "The thoughts and prayers of politicians are cruelly hollow if they are paired with continued legislative indifference. It's time for Congress to get off its a-- and do something." Sen. Richard Blumenthal said in a statement, "It has been barely a year since what was previously the largest mass shooting in American history — the deadly attack at Pulse nightclub. In the interim, thousands more have been lost to the daily, ruthless toll of gun violence. Still, Congress refuses to act. I am more than frustrated, I am furious." Woke up this morning to the horrifying news out of Las Vegas. Shocking and senseless. God bless the victims and their families. ABC News' Katherine Faulders, Ali Rogin, Kendall Karson and Rachel Tillman contributed to this report.